So, I’m vegan. I have been for over 3 years actually! And it’s a huge part of my life. But it can also be sometimes problematic in my life too. It is sometimes hard to find vegan options when I’m out at restaurants with my friends or family who aren’t vegan. Or when I’m shopping and so many brands aren’t vegan because they test on animals. There’s a lot of non vegan things in the world. The good news is, this year so far has been MONUMENTAL in terms of the number of new vegan products. There have been huge changes in restaurant menus, and even overhauls of entire companies going cruelty-free. Here are your updates! Covergirl has been one of the most influential and well-known makeup companies of all time. So it seems only right that they do whatever they can to expand their customer reach- including going cruelty free! They’ll be sure to make huge profits from the change that was effective starting in November of last year! The beyond meat burger was introduced to A&W stores last year and was crazy successful. People have been loving it so much, the chain is now going to be adding the beyond meat sausage to its menu! This change will happen across Canada on March 11th. 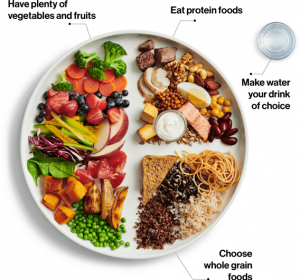 The Canadian food guide was recently revised, and good thing too! As shocking as it is, the change is much needed. The new food guide recommends water as the drink of choice, rather than milk, and emphasizes the importance of plant-based meals and diverse protein sources- not just meat products! The parent company of Herbal Essences, Procter & Gamble, has slowly inched closer and closer to ending animal testing within their company and in their products. They have recently also began to ditch animal ingredients, meaning many of their products are vegan! The brand is soon to get the cruelty-free bunny on their products. Starbucks iconic bottled frappuccinos have sadly not been made vegan- until now! There were rumours of this happening back in 2017 and it’s now a reality- in the US, and available only at Target. Here’s to hoping they bring them and their vegan cupcakes to Canada, please! Ben & Jerry’s launched their line of amazing vegan ice creams a few years ago. They’ve only gotten better since then, with the company recently announcing new flavours! The iconic chocolate chip cookie dough and more are only available in the US as of now- but are soon to be coming to Canada- keep your eyes peeled! That’s all the vegan news I have for now, but the world of vegan options is continuing to expand every day!